Bel-Air Productions | 50 Westerns From The 50s. 50s Westerns DVD-R News #83: Robbers’ Roost (1955), Tomahawk Trail (1957), etc. MGM and 20th Century Fox have announced a few more 50s Westerns for their MGM Limited Edition Collection. George Montgomery and Bel-Air Productions feature prominently in this batch. While it’s terrific to have these pictures available, most of the transfers thus far have been full-frame rather than the 1.85 ratio that was becoming standard (and still is today) — and that make good use of our new widescreen TVs. 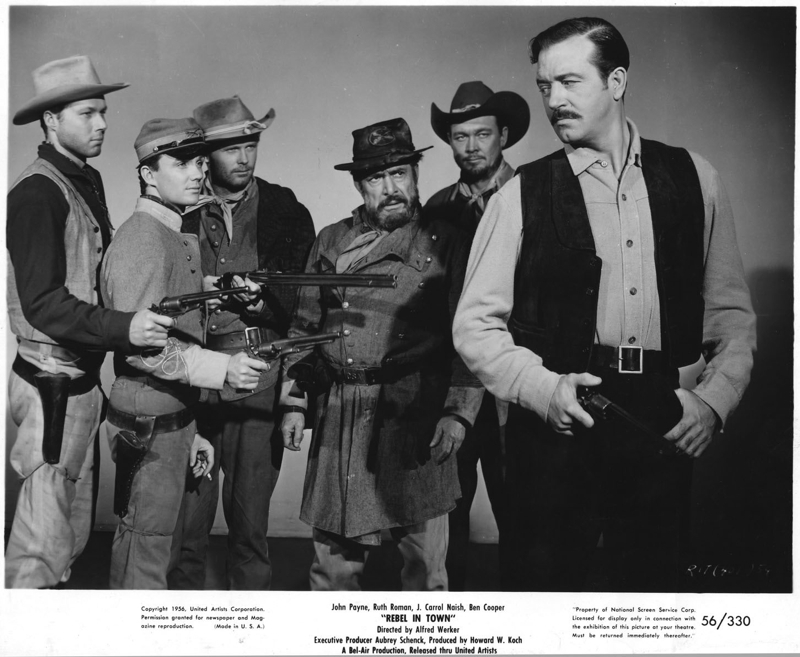 Robbers’ Roost (1955, above) stars George Montgomery, Richard Boone, Bruce Bennett, Warren Stevens (who passed away a week or so ago) and Peter Graves. Based on a Zane Grey novel, it was directed by Sidney Salkow. Montgomery’s Westerns from the latter part of the 50s are a mixed bag. This one isn’t one of his best — I’d recommend Masterson Of Kansas (1954) and Black Patch (1957). His hat in this one is really, really cool. 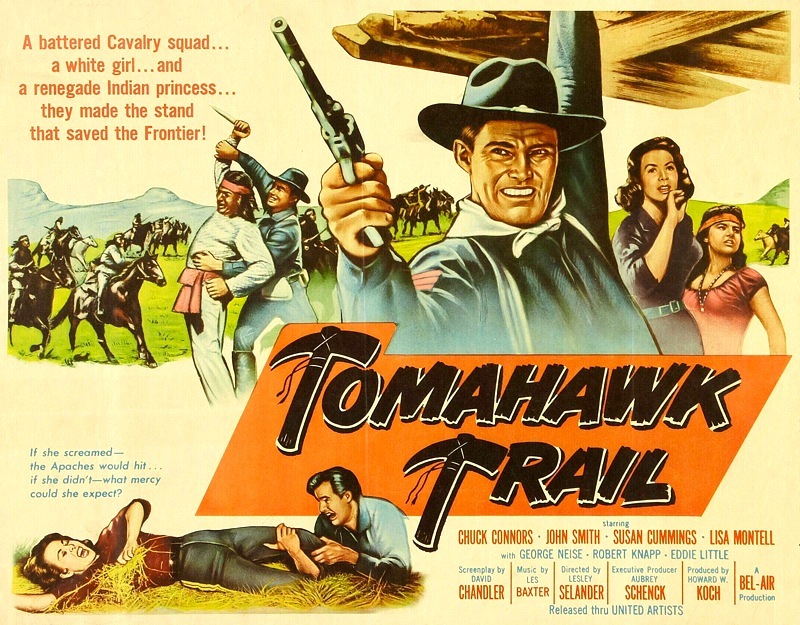 Tomahawk Trail (1957) puts Chuck Conners in a Bel-Air picture directed by Lesley Selander. This was one of Harry Dean Stanton’s first films. War Drums (1957) stars Lex Barker, Joan Taylor (who also recently passed), Ben Johnson and Stuart Whitman. Reginald LeBorg directed for Bel-Air Productions. 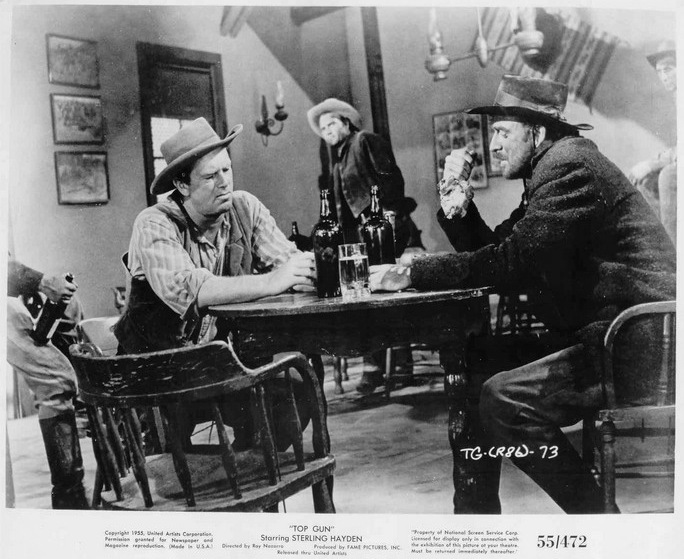 Toughest Gun In Tombstone (1958) is another George Montgomery picture, with support from Beverly Tyler, Don Beddoe, Jim Davis and Hank Worden. It was directed by Earl Bellamy. Noose For A Gunman (1960) comes from director Edward L. Cahn and stars Jim Davis, Ted De Corsia, Barton MacLane, Lyn Thomas, Harry Carey, Jr. and Kermit Maynard. It runs a brief 69 minutes — my kinda movie. Thanks to Paula for passing along the announcement. 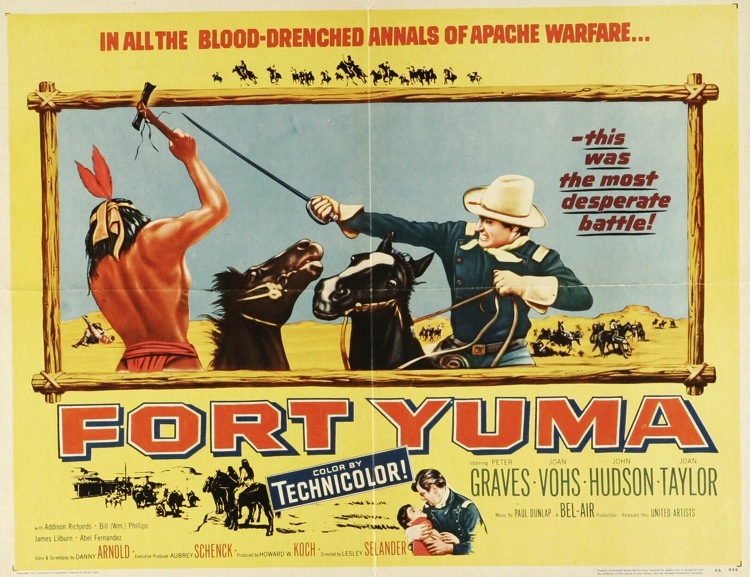 50s Westerns DVD News #58: Fort Yuma (1955). The MGM Classics Collection is at it again. This time with Peter Graves in Bel-Air’s Fort Yuma (1955). Directed by Lesley Selander, it was pretty rare for Bel-Air to splurge on Technicolor. Graves’ leading lady Joan Vohs was a Rockette and appeared in William Castle’s Fort Ti (1953). Gunfighters Of Abilene (1960), starring Buster Crabbe, and Gun Street (1961) — both directed by Edward L. Cahn. 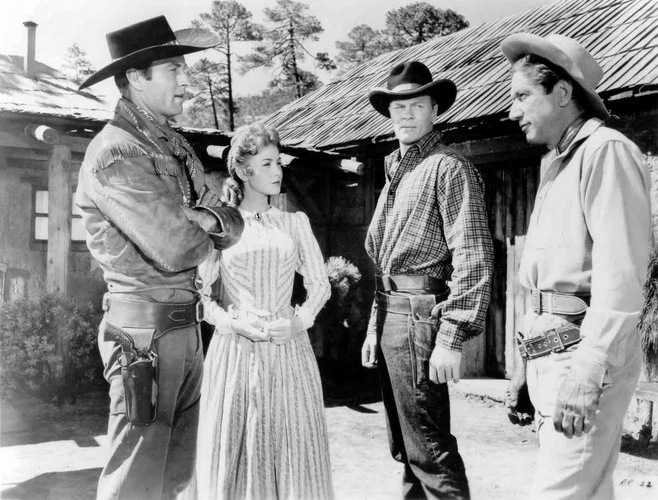 California (1963), an AIP picture with a great cast: Jock Mahoney, Faith Domergue, Michael Pate and Nestor Paiva. Alas, a great cast does not always make for a great movie. The Dalton Girls (1957) is a Bel-Air picture directed by Reginald Le Borg. Top Gun (1955) stars Sterling Hayden and John Dehner. It was directed, on a tiny budget, by Ray Nazarro. Trooper Hook (1957), from Charles Marquis Warren, has a great cast: Joel McCrea, Barbara Stanwyck and John Dehner. Valerie (1957), directed by Gerd Oswald, stars Sterling Hayden and Anita Eckberg. The underrated Oswald does a good job handling the picture’s complex, Rashomon-ish flashback structure. War Paint (1953) packs plenty of action into its 89 minutes — just what you expect from Lesley Selander. It stars Robert Stack, Joan Taylor and Charles McGraw. Also coming: Five Guns To Tombstone (1961) and one Ben Johnson fans have been waiting for, Grayeagle (1978).